This guide will focus on ergonomic cervical pillows that may be able help alleviate your neck pain. Hopefully, this will help you track down the perfect chiropractor recommended pillow for your neck and shoulder pain needs. If you feel like you want to check other options, we've compiled a list of our recommended pillows for 2019 in general with winners from every category. See the awards here. To get your shopping process off to a flying start, we have compiled the following list of 9 of the best neck pain pillows on the market today. To learn more about any of these cervical style orthopedic pillows, please take a moment to follow the included link to visit the Amazon product page. A model which uses shredded memory foam to create a comfortable platform for your head, this pillow from Coop Home Goods is available in Standard, Queen, and King sizes. 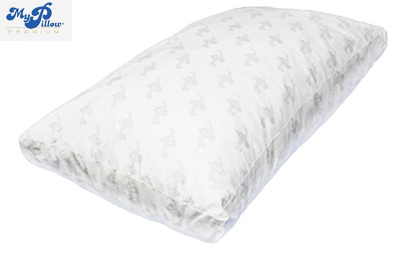 The pillow is made in the USA, and it has a cover which is 40% bamboo, the foam is CertiPUR-US Certified. Machine washable and sold with a five-year warranty, this is certainly a neck pain pillow to give a closer look. 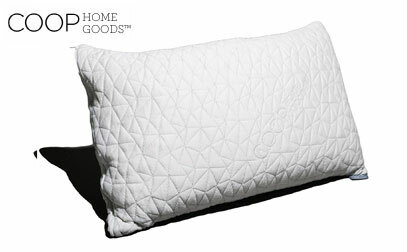 You will struggle to find a pillow in this market – or any market, for that matter – which has reviewed quite as strong as those left for this Coop Home Goods product. Simply put, past buyers love this neck pillow because it reduces neck stiffness. Sure, there are a few detractors here and there, by they are dramatically outnumbered by those who are happy with the product. It is said to be soft and still supportive, good for neck pain, and more. It will likely have the same odor that is commonly associated with memory foam when first opened, but a short period of off-gassing should solve this issue. If you like to buy your products on the recommendations of other buyers, this is a pillow that should be one of your leading candidates. 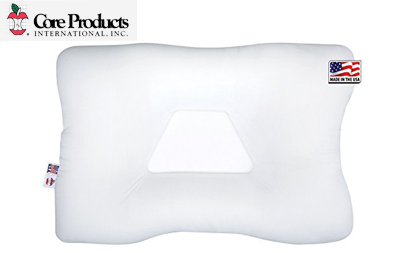 This pillow from Xtreme Comforts has just about everything you could want in a pillow that is meant to combat neck and back pain. It is filled with shredded memory foam, which is one of the best materials for getting your head and neck into a comfortable position. Rather than a solid piece of memory foam, the shredded bits can be shifted around to form a perfect landing place for your head at night. 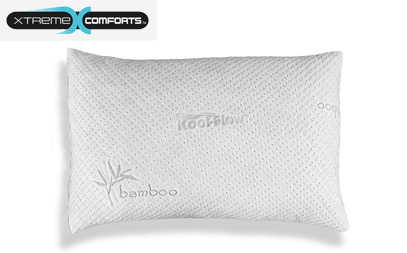 The ergonomic pillow machine washable, the cover is made of 43% bamboo and is designed to keep you cool (see our favorite cooling picks), and there is a money back guarantee. When you combine all of these features with a very reasonable price point, it is easy to see why so many who suffer from neck pain and headaches have given this model a try. The comfort of this neck support pillow is one of the top points praised by previous buyers. There are plenty of glowing reviews which have been left by users, and only a few negative comments are to be found. One possible concern is that the pillow may be a little firm, but this is not an opinion shared by a large number of users. 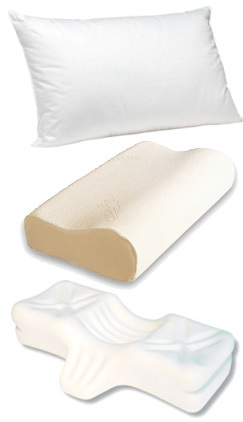 Overall, the Shredded Memory Foam Pillow from Xtreme Comforts is a popular option, and one of our top picks. This next option on our list is one of the leaders in the neck pain pillow market. 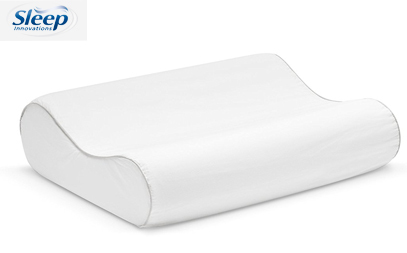 As you can see from the name of the item, this pillow uses water to provide support to your head as you sleep. 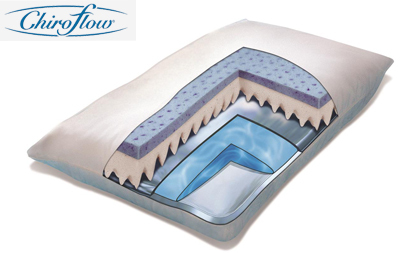 In addition to the water, the pillow also includes a hypoallergenic fiber filling to complete the experience. There is a 30-day satisfaction guarantee which covers this pillow, and the price tag falls right in line with most other choices on the list. Overall, there are plenty of compliments to be found for this neck pillow. Among the tributes that have been paid by past users include the pillow’s ability to improve neck pain (including a stiff neck), along with the comfortable experience had when sleeping on the Mediflow Waterbase. Simply put, it's one of the most comfortable pillows available today. A common complaint, which is see across the board when it comes to water pillows, is the weight of the product. Once you fill any excellent pillow with water, it is going to be quite heavy to move around. This is not necessarily a bad thing – the pillow will stay nicely in place – but it is something to be aware of as you shop. 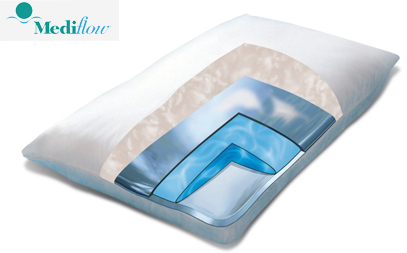 If you are interested in a water-based ergonomic pillow, and you have neck pain to deal with, this choice from Mediflow is one of the leaders. If you watch any cable TV in your day to day life, you have probably seen commercials for the MyPillow brand. This is an actively marketed product, and that strategy has led to quite a bit of success. One of the most expensive neck pillows on our list, the MyPillow is made with ‘interlocking fill’ which is meant to adjust to your needs in any sleeping position. There are four unique loft levels available, so you can pick out a pillow which should be an appropriate size for your body. The product is made in the USA, and it is both machine washable and machine dryable. Unfortunately, the reviews left by previous buyers don’t quite match up with the popularity of this pillow. Of course, that is not to say that there are no satisfied users. Plenty of people feel that it is the best pillow they have ever used – and plenty of others have the opposite opinion. While ergonomic pillows are always going to be a personal preference type of product, there are enough negative reviews to dictate that you should at least consider some other options before you order. It is the shape of this pillow that earns it a spot on our list of pillows that can help to alleviate neck pain, as well as back pain. This pillow comes in a total of three sizes, meaning you should be able to pick one that addresses your personal needs nicely. 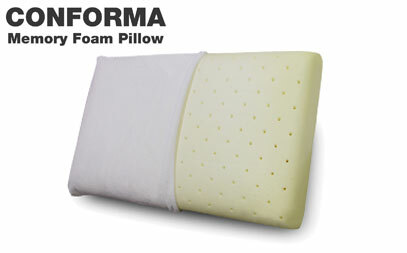 There are also a couple of colors available, and the cervical pillow can accommodate most sleeping positions. With a price point that comes in below many of the other options we have presented, you would be wise to give this uniquely shaped pillow a closer look. So how do past users feel about the performance of this product? Many are impressed with what they have found. Some state that the pillow has indeed improved their neck pain, just as hoped. Of course, there are those who are less impressed, having issues with the amount of support that is provided by the item. There are enough positive reviews to keep this neck pillow near the top of your shopping list, so be sure to consider it carefully while making your final decision. This next neck pillow is one of the least expensive that we have included in the list. However, despite that modest price, there are still plenty of positive attributes to note concerning this contour pillow from Sleep Innovations. It is 100% cotton, made in the USA, and uses memory foam to contour your head. There is a 5-year warranty which stands behind the pillow, and the contoured design will work to keep your head in an appropriate position as you sleep. Strong reviews follow this contour pillow, as many buyers are happy with what they have received. Again here, we see comments from users that feel this pillow is responsible for eliminating their neck pain after sleeping. While memory foam is not for everyone, it does seem that this pillow has done an excellent job of impressing the majority of its owners. As long as you are okay with the characteristics that memory foam brings to the table, you should be able to buy with confidence. For a pillow that is going to use its shape specifically to keep your head in a comfortable spot, you may want to check out the Arc4Life Cervical Linear Traction Neck Pillow. While this is among the most expensive products on our list, it does have many design elements that warrant the price tag. There is a ‘V’ at the bottom of the pillow which cradles your neck, and there are thick side wings meant to work nicely for those who sleep on their side. Considering the lofty price tag associated with this neck traction pillow, you would like to see an extensive list of good reviews. Unfortunately, that isn’t the case with this traction style pillow. Yes, plenty of the past buyers are happy with what they received, but many are not. It is the lack of overall support that seems to be an issue for some users, along with longevity concerns. You should still consider this traction pillow due to its contouring shape, but check out others as well before you order. One of the leading complaints that are seen concerning pillows with memory foam is the tendency to get rather hot as you sleep. The Classic Brands pillow seen at this point on our list gets around that problem with the use of ventilated memory foam. Small holes in the foam allow for airflow without compromising the ability of the product to support your head. 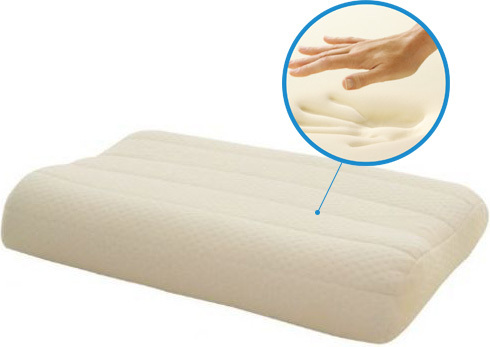 Also, this pillow includes a cover which is removable and washable, and the foam is hypoallergenic. You will be happy to see that many of the past buyers are satisfied with the way the product performs for them each night. Plenty of users feel that this is one of the best neck pillows they have had, although it may take a short period to get used to it (depending on what kind of pillow you have been using previously). Considering the positive overall reviews and the modest price point that comes with this item, you should keep this one up near the top of the list. The Chiroflow is a water-filled pillow. With a reasonable price tag, this pillow will be ready to go once you add the appropriate amount of tap water. Since you can control how much water is put into it, you will be able to adjust the firmness and thickness to suit your needs and preferences. The adjustability is one of the top reasons to consider using a water pillow. Excellent reviews are the order of the day when taking a look at this neck pillow. Previous buyers are mostly impressed with what they received for their money, with compliments ranging from reduction in neck pain to the pure comfort of the item. As long as you aren’t put off by the heavy weight of the pillow when filled with water, this is a product that is likely to exceed your expectations. Generally speaking, neck problems are caused by an awkward sleeping position. Of course, what is considered ‘awkward’ will vary significantly from person to person, as all of our bodies are unique. However, you probably already know what kind of head and neck position is comfortable for you at night, and what type of position is going to lead to pain. You know your body better than anyone, so trust your instinct when trying to settle into a comfortable position each night. When shopping for a good neck pillow for sleeping, you should be looking for a product that is going to make it easy for you to find a comfortable position for your head and neck. If you like to have your head well up off of the mattress, that may mean choosing a firm option like memory foam. Or, if you prefer to lay mostly flat, you might like a softer choice. Whatever the case, always keep your personal needs and preferences in mind as you shop. The reviews of other buyers are helpful, but their opinions should never get in the way of making a choice that is right for you. Are you a back sleeper? 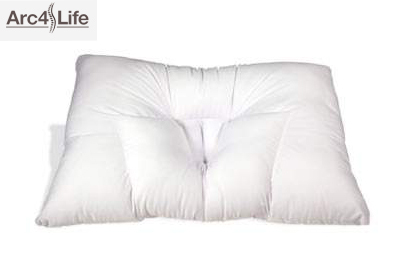 Check out our top back sleeper pillows picks! If you decide to search for a cervical pillow to alleviate your neck pain by merely heading to Amazon or another site and searching ‘neck pain pillow,’ you are going to receive an overwhelming number of results. It is incredible to see just how many different neck support pillows are on the market today. Going into this shopping process without a general idea of what you are looking for would be a big mistake – you would waste time, and you likely would not come away with something that suits your needs nicely. The first thing to understand is the different materials that are used for stuffing within pillows meant to help neck, shoulder, and back pain. By far, the most popular option is memory foam. 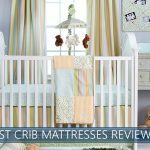 As you know, memory foam is already a commonly used material in mattresses, and it is now one of the leaders in the pillow world as well. There are therapeutic neck traction pillows made from substantial chunks of memory foam, and also some made from shredded memory foam. Even if you don’t wind up purchasing a memory foam pillow, it would be wise to at least consider this category as you shop. Surprisingly, water pillows are another option for those suffering from neck pain and headaches. You may not think about water as being a viable option for fill material, but it works quite well when used correctly. Water cannot be compressed, so it is almost always going to offer a firm feel when you lay your head down at night (depending on the specific design of the pillow you select). Using a water-based neck pillow may seem a little odd, but don’t write this option off until you take a closer look at how it works. Due to the shape of your head and neck area, it can be difficult to lie comfortably on a flat surface without developing pain in your neck (or shoulders). Using a contour shaped pillow, such as a cervical pillow, can potentially solve this problem, however. Cervical pillows do a nice job of filling the space between your neck and the mattress, providing the support you need throughout the night. In the modern world, it has somehow become ‘cool’ to go without much sleep. Many adults see sleep as laziness, and they try to prove how hard-working they are by talking about how little they sleep. This is nonsense. Rest is an essential human function, and it is vital to your overall health. If you would like to be at your best on a daily basis, you need to get your sleep – it is just that simple. Finding a great ergonomic pillow that can help reduce your neck problems is an efficient way to improve your sleep each night. Not only will you enjoy waking up without a stiff neck, but you will also be likely to sleep better during the night because you won’t be awoken by pain or a throbbing migraine headache. People who sleep well tend to report lower levels of stress, greater happiness, and an improved quality of life. It might be hard to believe that something like a neck support pillow could have such a profound effect on your life, but it’s true. 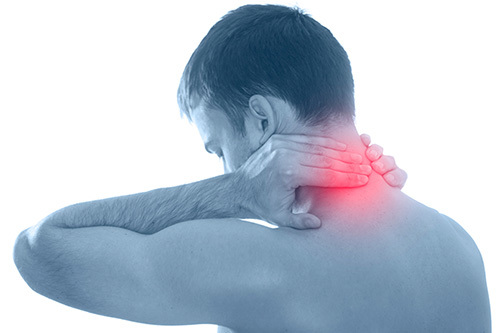 Pick out an excellent pillow for neck pain, and you may see your life improved in ways you would have never imagined. With the assistance of the list above, you should be well on your way to finding the right cervical pillow for neck pain for your needs. When you do order a new orthopedic pillow, give yourself a bit of time to adjust to it before you expect significant results. It can be hard to make the transition to a new neck traction pillow, even if that pillow is a quality product which fits your needs nicely. Give the new neck pillow some time to become comfortable, and you will very likely be pleased in the long run. Thank you for taking the time to stop by our 2019 neck pain pillow buying guide. We hope you found the information you needed to make a significant buying decision. Happy shopping, and sleep well! Never thought about buying something like water base pillow, anyone tried it? Hi I have recently started getting migraine like headaches with nausea and occasional vomiting often waking me in the night with onset. After one massage and some dry needling it was decided my muscles in shoulders were contracted causing contraction of neck muscles thus reducing blood flow and creating nerve response which is similar to migraine. I am waiting for CT results to confirm no degeneration or injury. I have reduced to one feather pillow and trying to sleep on my back. My biggest hurdle at present is I can’t bear anything pressing into my head or neck which I find causes a headache. I am looking for a sleep solution to resting my head supporting my neck but not contacting those ares …any suggestions? I would definitely wait for CT results and check with your doctor before making any decisions. From my experience, I would say that memory foam would work much better than any other type due to its contouring and pain relief properties. Just ordered Coop Home Goods, heard good things about it and couple friends have it so hopefully it will be better than my down pillow I’m using right now. I recently came down with severe neck pain and has put me out of work for a while. I really hope it’s not sleep related, because I already have a number of bills I will just barely be able to pay off. I ordered a MyPillow because my current pillow is ancient. We’re currently looking into updating our pillow content. Keep checking back! I had a cervical fusion 11 years ago and cannot find the perfect pillow. I wake every morning with a headache. I have bought: feather, fibre fill, latex, memory foam – normal shaped and contoured. I have a dozen pillows and am still searching for my holy grail. Any suggestions? Hi Elizabeth. Thanks for reaching out. Unfortunately, a pillow quest is a highly personalized choice as everyone’s head and neck are shaped a bit differently. Trial and error are your best bets, but you may look for pillows that are adjustable or allow you to rearrange the fill so you can get more “tries” for your money. I hope this helps! Just got out of hospital where l had x rays and MRI scans for my head and neck, all came back normal. Still getting head/neck pain when I awake so am looking for a new pillow. Any ideas please???!!! I bought a synthetic feather pillow and opened a seam about six inches. Then reach in and I took almost half amount of stuffing. Sewed it up. Now it is perfection for me. I can push it around to whatever I need. I can still machine wash and dry. Pure bliss. It iwas a king size. I’m 83. No medicines etc.